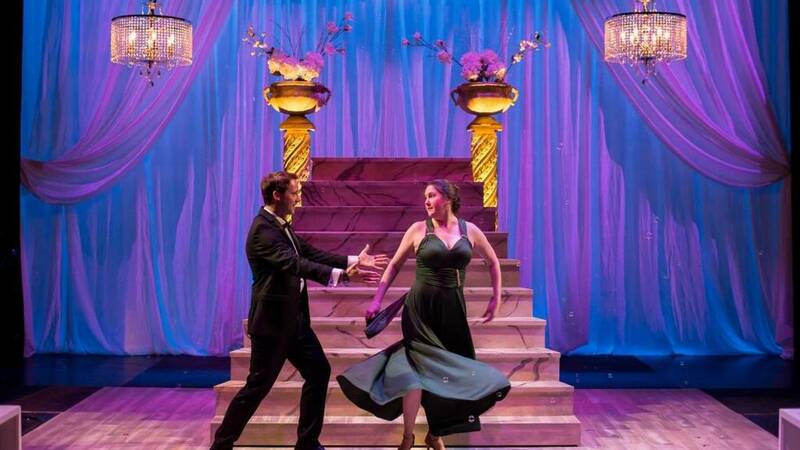 MIAMI: People attend live theater because they “feel other people’s emotions, see the world like they do,” opines a character in Dancing Lessons. The young woman is injured Broadway dancer Senga Quinn. She could easily be talking about the moving, comic and sweet, but not sugary play in which she appears. Dancing Lessons is a taut yet meaty piece by Mark St. Germain. 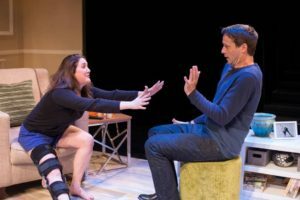 The play runs through March 25 in the South Florida premiere of Zoetic Stage’s Theater Up Close 2017-2018 series. Zoetic, an award-winning company, is deftly presenting Dancing Lessons within the intimate Carnival Studio Theater within the Adrienne Arsht Center for the Performing Arts of Miami-Dade County. 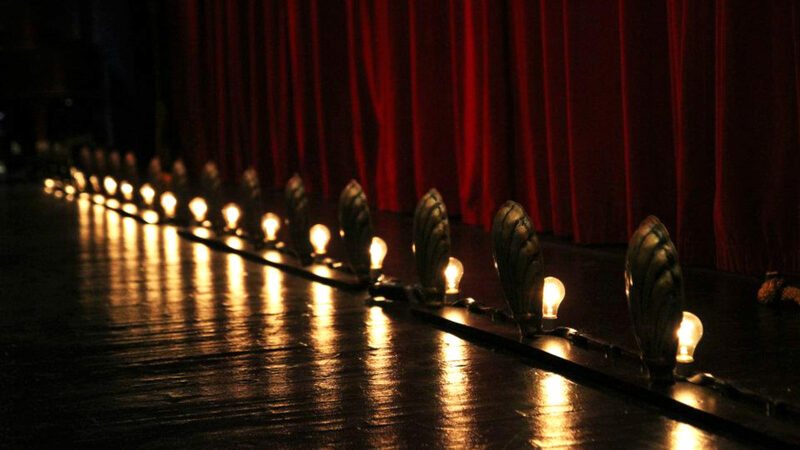 Our proximity to the stage enhances the power of this heartfelt production of St. Germain’s play. We feel as though we’re inside Senga’s cozy New York City apartment. We meet her and the play’s only other character in this apartment, one of the play’s two settings. Senga has suffered major leg injuries in an accident. It’s sidelined Senga and made it likely she’ll never dance again. If she is physically hurting, the emotional pain she’s experiencing could depress anyone. Moreover, due to her life-threatening allergy to anesthesia, her chances of surviving surgery are minimal. At the same time, if she can never again do what she loves, she’ll feel as though she’s dead. But Senga doesn’t resort to self-pity. St. Germain has created a character with whom it’s easy to sympathize. It helps that Lindsey Corey invests Senga with a sincere desire to return to dancing. As close as you are to her, you practically want to comfort her, knowing her tough situation. Senga might welcome the support; she is open to people touching her. One, however, cannot say the same for Ever Montgomery. The professor of geosciences at the New York Institute of Technology has Asperger’s Syndrome. This condition is a “pervasive developmental disorder characterized by an inability to understand how to interact socially,” according to medicinenet.com. “You’re autistic?” Senga presses on. In Ever’s case, he’s extremely hyper, lacks social skills and cannot bear someone touching him. That is, until after he gets to know Senga, his neighbor. She changes him in a way many would probably think is impossible. Without sounding like a lecture, or a jargon-filled piece, Dancing Lessons is an awareness-raising gem of a play written with flair. It manages to entertain, enlighten and touch us. Senga and Ever are two people who, under different circumstances, would never have met. But due to Ever’s strong desire to learn basic dance for a ceremony honoring his work, the pair meet. After they become acquainted, under Stuart Meltzer’s sensitive, detailed direction, the relationship grows slowly, practically unnoticeably. The pair’s journey grows from intense, palpable tension to wary, but willing cooperation. There’s even a hint of admiration from Ever. St. Germain slowly but surely peels away layers from Senga to reveal surprising facts about her. She and Ever come to realize they have more in common than they thought. Watching them, a realization washes over us: If we’d only be more open to connecting with others, we’d be pleasantly surprised at what we might discover. Dancing Lessons isn’t just a simple romantic or awareness-raising play. For a script that’s 37 pages long, St. Germain packs a lot to ponder or realize anew. To his credit, the play doesn’t feel overstuffed and St. Germain doesn’t offer easy answers. But while he puts our minds to work, he also delights with a quirky sense of humor which the two performers nail. We could quibble with the questionable spots in the script in which St. Germain inserts sections of Ever lecturing to his unseen students. The transitions in and out of those scenes don’t quite flow naturally. That aside, we come to admire this pair. Watching Ever wince, but with effort, touch Senga and awkwardly dance will melt your heart. Have a hanky handy. As Ever, Caleb Scott intensely and truthfully conveys Ever’s feelings. He’s a knot of nerves — a hyper individual who suggests a hyperactive teenager forced to do something. Scott’s Ever, though, is a fighter. He is willing to step out of his comfort zone, making us admire him so much more. At its core, this play is about people’s capacity to change. Throughout the play, we’ve pulled so strongly for Ever to summon the courage to embrace Senga. When the moment finally arrives, tears flow. As Senga, Lindsey Corey offers a well-rounded, sensitive performance, transitioning seamlessly between several emotions. Corey’s more understated Senga serves as a nice counterpoint to Scott’s much less subtle Ever. Michael McKeever, Zoetic Stage’s managing director/founder, proves his versatility with his homey, spacious design of Senga’s New York City apartment. The drawn blinds reinforce Senga’s isolation from the world. If we look hard enough, the world is full of people who can have the most profound effects upon us. Our openness toward them can benefit us and we can benefit them. St. Germain has sensitively created two such individuals.